The world has now installed more than 1,000 gigawatts (GW) of wind and solar power, according to fresh data analysis. Researchers from Bloomberg New Energy Finance (BNEF) announced the news last week, based on its own database of over 100,000 projects around the world. As of 30th June 2018, analysis shows there is now 1,013GW of wind and solar PV, evenly balanced between the two: 54 percent wind and 46 percent solar. The milestone is the latest sign that the world is making swift progress towards a low-carbon transition, driven by high levels of investment and the declining cost of building new renewable plants. 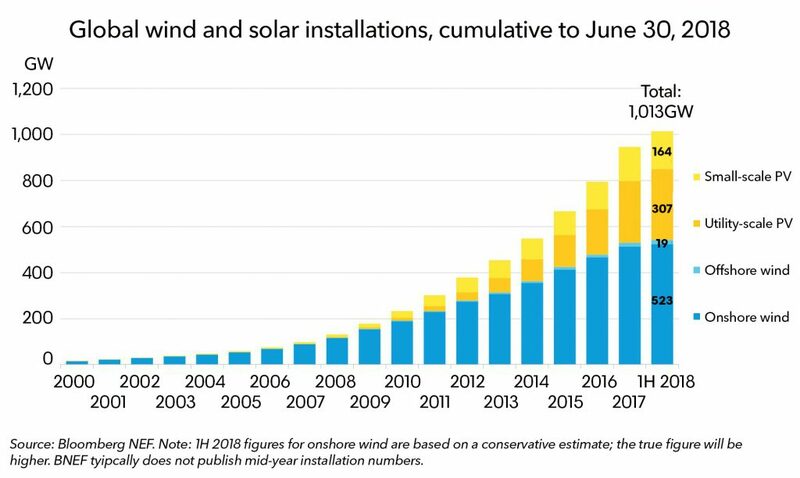 Since 2000, wind and solar capacity has increased 65 fold, with advances taking place at a speed which has defied forecasts. And whereas the first 1,000 gigawatts of wind and solar required an estimated $2.3 trillion of capital spend, the next milestone will be much cheaper. To reach 2,000 gigawatts will only cost $1.23 trillion, according to BNEF, set to take place over the next four years. Previous research from BNEF has forecast that by 2050, 50 percent of all global electricity generation will come from these two renewable sources. Mr Cheung also drew attention to the importance of storage as this growth continues. So far, investment in battery storage has helped the cost of lithium-ion batteries fall by 80 percent since 2010.